The second green, N2 "dark green", is a viridian green with a discernable blueish caste, but not as blue as its closest FS equivalent of 34058 @ 3.99 which is not a particularly useful match. In his studies of Japanese aircraft paint colours at NASM Robert C Mikesh has continued to use Thorpe's designations when grouping and classifying measured colours, as well as adding his own "Thorpe-style" designations for the identification of interior paint colours. 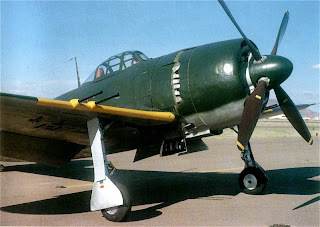 The Imperial Japanese Navy Air HQ paint colour standard Kari Kikaku 117 (Provisional Standard 117), often abbreviated to "Kariki 117", originates from 1938, but one of the documented copies is annotated as "Air HQ Revision 2943 of April 10th 1942". 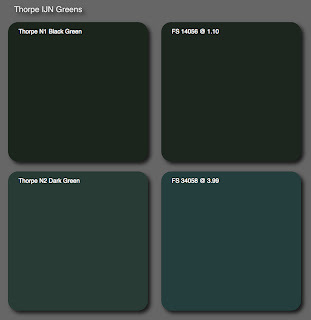 This document does not, of course, use the Thorpe/Mikesh designations but presents a rather bewildering variety of greens in the 'D' grouping Midori Iro (Green Colour), ranging from a very dark black green to what may be described as a very bright leaf green. 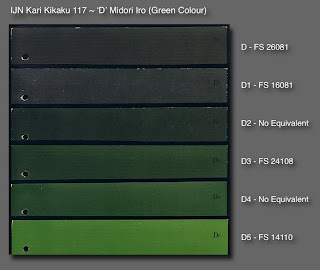 Reconciling these paint colour standards with what has been seen and found on actual airframes is one of the challenging mysteries of the subject, because despite the revelations of Kariki 117 very little factual information about exactly how the colours were used has surfaced. Although the Japanese Navy designations 'D1', 'D3', etc., have been referenced in various aircraft type specific studies it has never been made very clear how these associations have been concluded, whether by contemporaneous documentary information or archeological matching. The other complication is that although the Kariki 117 paint colour standard swatches have been photographed and published and matched to current FS595B and JPMA (Japanese Paint Manufacturers Association) colour decks (the latter corresponding to standard Munsell values) as far as I know they have not been measured using spectrophotometric equipment. The problem with visual matching is that it is subjective and highly dependent upon an individual perception of colour - which may be flawed. We are not talking colour blindness here, but more about levels of colour perception ability (poor, average, good) and any inherent hue bias (yellow/green, brown). In reinforcing these subjective visual matches there is a tendency to put forward photographs of the original swatches in juxtaposition with the modern paint colour decks. In some cases, and allowing for colour reproduction integrity, there are corresponding similarities, but in some the matches appear to be in name only. The person matching has struggled to find the nearest appearance to the original, sometimes qualifying the differences subjectively, with the inherent risk of demonstrating perceptive bias* across the three characteristics of hue (shade), chroma (saturation) and lightness (intensity or value), as well as perceptive bias in perceiving and articulating any difference. Those who own the corresponding colour standard decks may be able to compare the examples for themselves and achieve some understanding of what is being communicated but those without such resources may find it difficult to visualise the prevailing characteristics of the colour(s) being studied. Beyond this is the ever hungry demand for the simplicity of equivalent hobby paints and an availability of corresponding proprietory paints that spans a two decade period (and in some cases longer) of ever changing data and knowledge. Thus a bottle - or tin - of "IJN Dark Green" may represent the very latest data and thinking, or the understanding of many years ago and long superceded. But hey, dark green is dark green, right? Matching to equivalents across standards sometimes leads to other margins or error, where for example the closest FS595B match (which may not be a very good match at all) is quoted so frequently that it is eventually assumed to be the actual and correct colour, and is popularly used as the basis for mixing or creating a hobby paint. From these transmogrifications often emerge modelling conventions about how certain colours are supposed to look and a pervasive derivative and imitative trend develops which can and sometimes does obfuscate the original data. Only the most inquisitive will seek out the buried treasure but they should be prepared for a lonely journey, satisfactory only in respect to their own models. Shouting into the storm of noise where the biggest blowhards prevail is ultimately futile. And these are just headline points, within each is a vast array of possibilities and permutations which are usually impossible to quantify. This rather plodding phalanx of preliminary waffle is intended to frame the information to be presented about the colours of Kawanishi's sparkling floatplane fighter development and will hopefully be borne in mind when considering the findings here and elsewhere. * The word "bias" is used not in the sense of any deliberate preference but only in respect of the unique way in which the individual observer's eyes and brain process the reflected colour information. Image credits: Wiki Photo; Rendered chips ©2010 Straggler from original Thorpe Munsell values; Extract of Kariki 117 pages Summer via Fuku with commentary based on information provided by Ryôichi Watanabe in Arawasi magazine #9 (Apr-Jun 2008). Thanks Nick, for the scans and summation. FWIW, the color of the profiles in the most recent FAOW volume on these types shows a very strong resemblance to your rendition to Thorpe N2. What particular aircraft is the George in the picture and where was this taken? That is s/n 5312 after restoration at (I believe) the USAF Museum at Dayton, Ohio. Mentioned in Part One posted today.